Dream Your Ride : Adventure Touring is all about the adventure. The bike is simply the vehicle. Adventure Touring is all about the adventure. The bike is simply the vehicle. 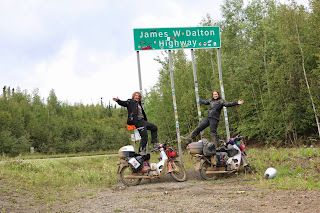 I'm trolling Facebook and on one of the adventure touring pages I see photos from a couple from the UK who are riding from Alaska to Argentina on Honda C90's. Most riders would consider anything smaller then a 650 cc machine to be too small for this type of trip, but not this couple. Currently they are in British Columbia Canada and are experiencing some snowy conditions and yet they are pushing onward. 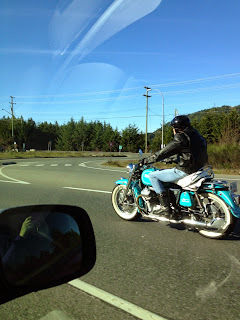 Check out their blog at Wonder On A Honda or on Facebook at Facebook Wonder On A Honda. Proof that any motorcycle / scooter can be used for adventure.